Shopping for a baby or toddler is always a lesson in just how adorable everything is when miniaturized , but combine that intrinsic awz-factor with a local tie-in and you've captured my heart. So it's with pleasure that I bring you a guide to dressing your li'l in local! From screenprints to handsewn to a Saskatoon shop that brings you lovingly crafted pieces from around the world, you're sure to be inspired to show some local love. Rain Melody specializes in baby and toddler clothes, handsewn by my friend JoElla in 100% organic cotton. My husband especially loves the rompers which go on with ease, are an all-in-one outfit, and are super soft and cozy. Order on Facebook or Instagram by choosing your pattern and fabrics, thereby creating your one-of-a-kind piece! 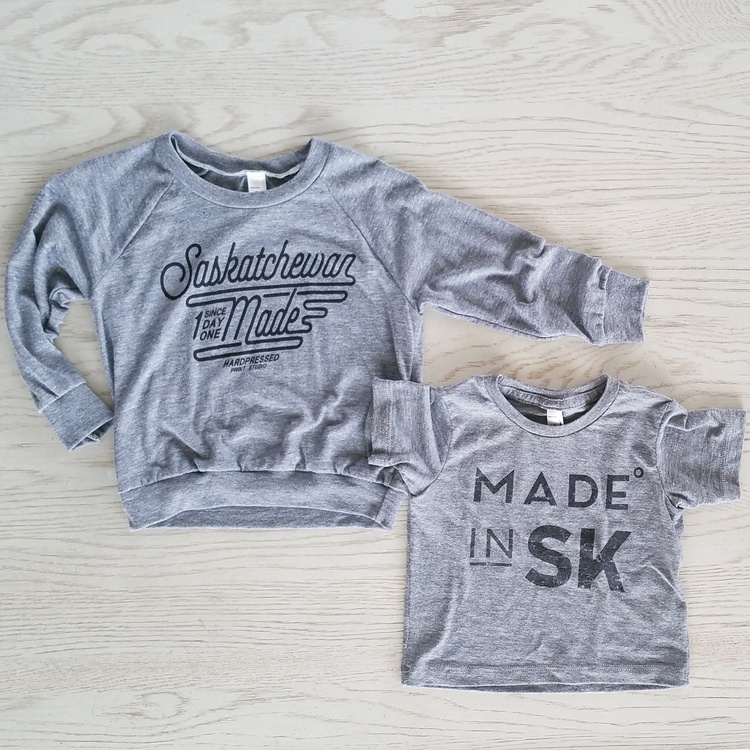 You know Hardpressed for their locally-loud designs but did you know there are mini versions of the most popular Saskatoon stuff? Truthin' it! Pick your wee tees up at their storefront on 20th or online. If you have a little girl or you have a friend that does, a bonnet is a must. ForEverlyYours is your bonnet source in Sask, and they offer an array of other cutesie pieces, too. For the boy babe in your life, they also do little beanies, so be sure to check out their Facebook page for deets. Apple Tree Baby's Grow Pants are a thing of magic. Sized for three months to an unbelievable twelve months per ONE PAIR OF PANTS, the secret is stretchy fabric and a bit of folding. Plus, they've got the middle gusset which is perfect for when baby starts stretching and crawling. Find these and more on the Apple Tree facebook page. Last but certainly not least is Willow and Wheat, which I first heard about when my OCM sister Lisa Landrie profiled Stephanie and her biz. I immediately bought Petra three bandana bibs which I find are fashionable enough to wear beyond the dinner table. But as I've followed Willow and Wheat's insta feed, I've been BLOWN AWAY by the fabric combos and offerings beyond bibs. That teether? So sweet. And can I swoon more over a blanket because I don't think so. Check her out on Etsy.